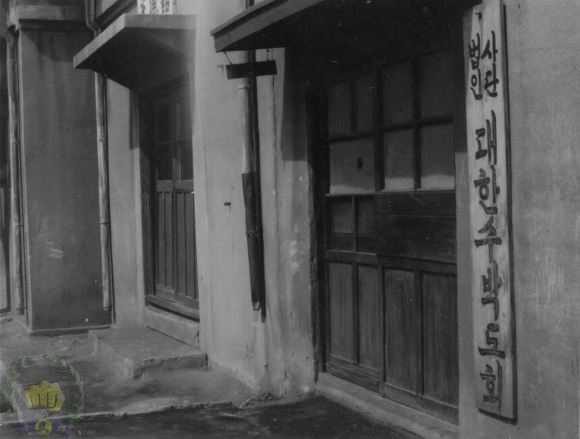 Main entrance to Moo Duk Kwan Headquarters in Seoul, Korea, it was called the “Joong Ang” Do Jang. 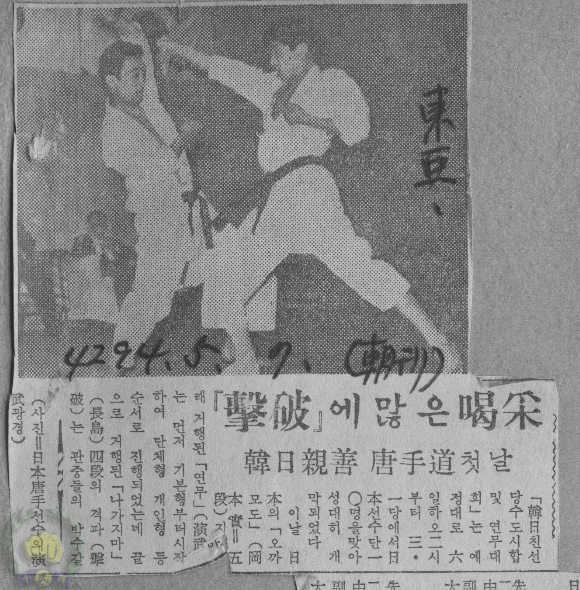 1960 June 30th, Moo Duk Kwan and Ji Do Kwan were joined as the Korean Soo Bahk Do Association, headed by Kwan Jang Nim Hwang Kee. 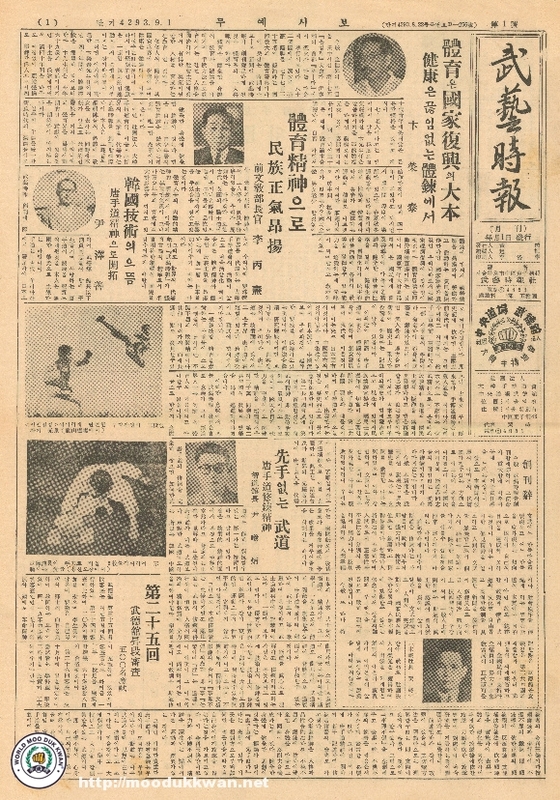 The monthly newspaper was published by the Korean Soo Bahk Do Association Moo Duk Kwan; 1st issue published on September 1, 1960, publication ended on April 1, 1961, with a total of 8 issues, due to the military coup on May 16, 1961, the publication was titled Moo Yei Si Bo. 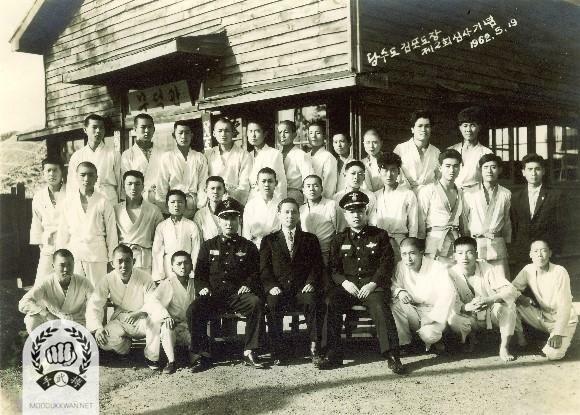 1960 June 30th: Using ancient Korean martial arts name, incorporated and registered with the Korean Ministry of Education under the name of Dae Han Soo Bahk Do Hoe (Korean Soo Bahk Do Association) becoming the first member association. 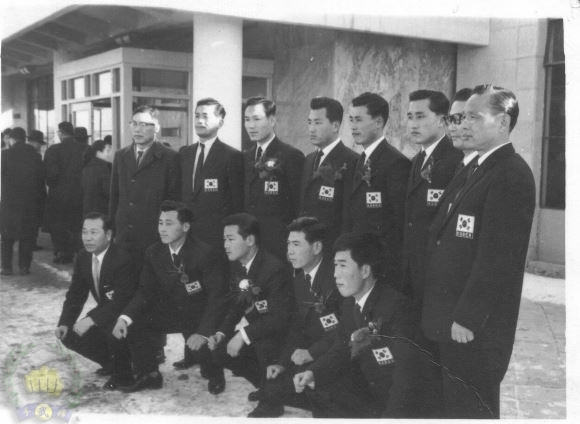 Annual Moo Do contest at Ministry of Transportation Korea, Cho Hwan (Dan Bon #80) is receiving the award. 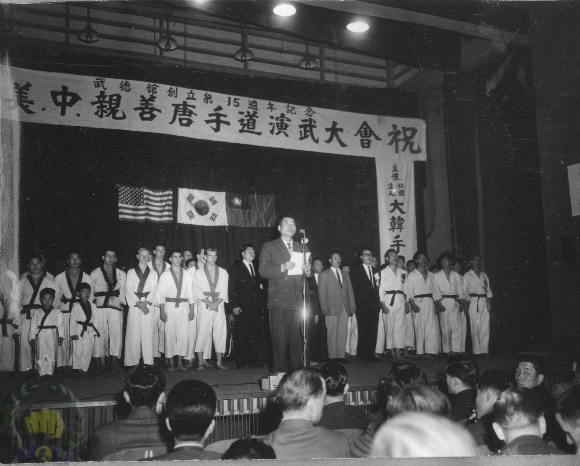 Opening Ceremonies for the 15th Moo Duk Kwan Anniversary, Goodwill demo between USA, China and Korea. The Founder is presented a gift. 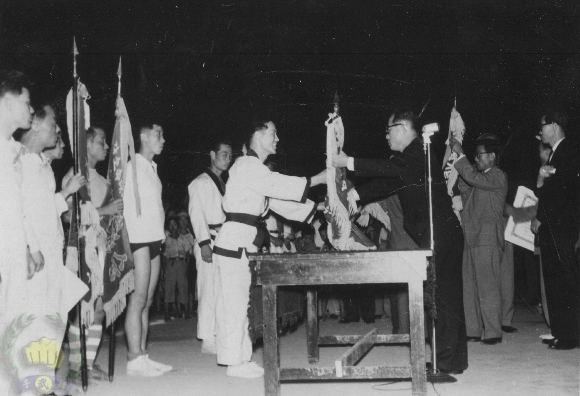 Opening Ceremony at the 15th Anniversary of the Moo Duk Kwan in Korea 1960. 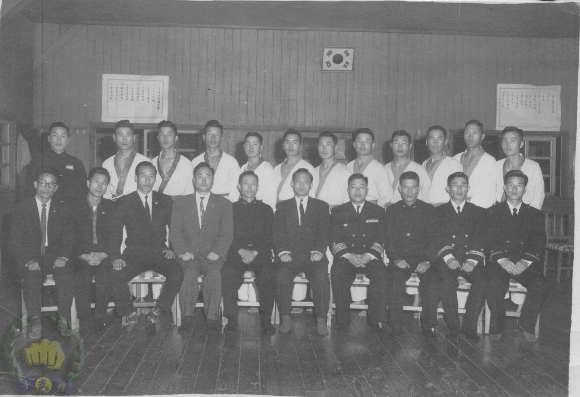 Naval Academy Cadets in 1960, Founder Hwang Kee is seated in the center, and Jin Tae Hwang SBN (Dan Bon #11), the instructor of the cadets, is shown in the group. 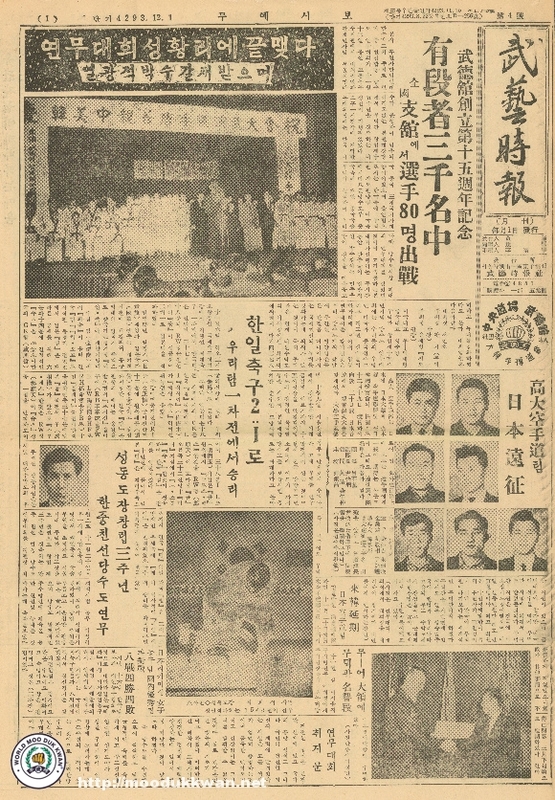 Yong Deung Po Dojang in Seoul Grand Opening with new constructed building on Nov 12 1960. 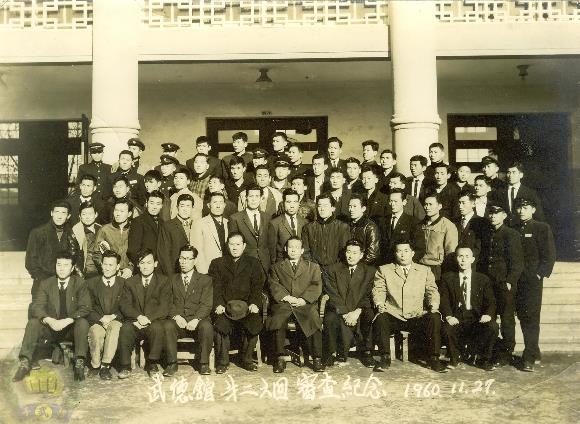 The Founder is seated in the center. 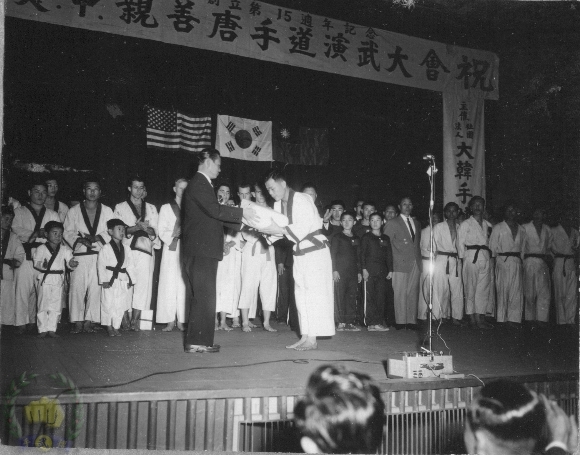 Founder Hwang Kee, receives flowers from his student at the 15th anniversary celebration. 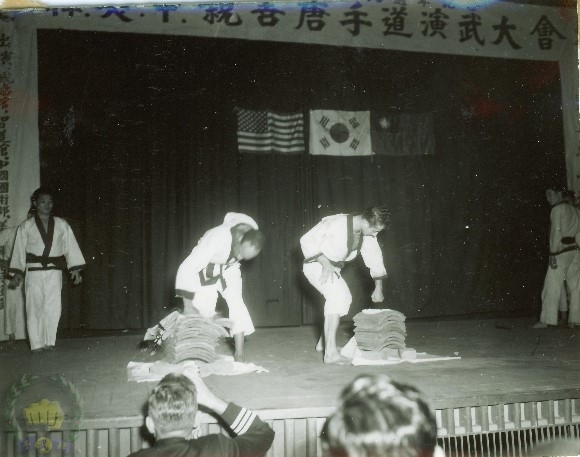 Kyok Pa demonstration by Robert Thompson (Dan Bon #1791) on left and Frank Scarlecio (Dan Bon #1790) on right in 1960 during the MDK 15th years of anniversary demonstration. 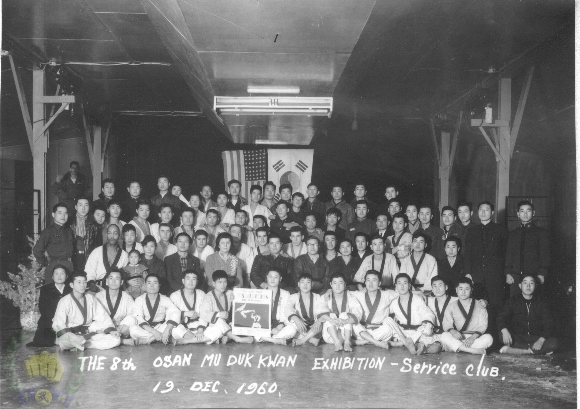 Osan Air Force Base Moo Duk Kwan exhibition in the service club, Dec 19, 1960. 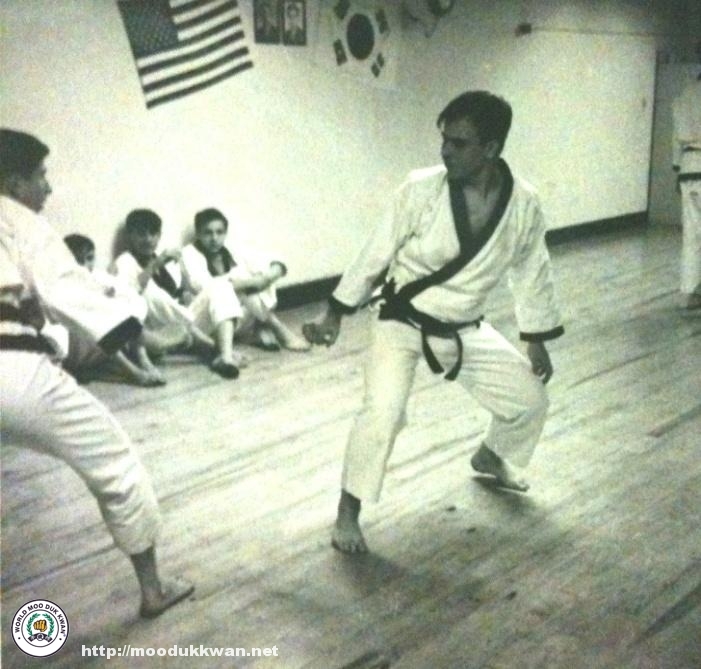 Of interest in this photo are Robert Thompson (Dan Bon #1791) and Carlos (Chuck) Norris (Dan Bon 2819), both went on to open do jangs in the USA in the 1960s. 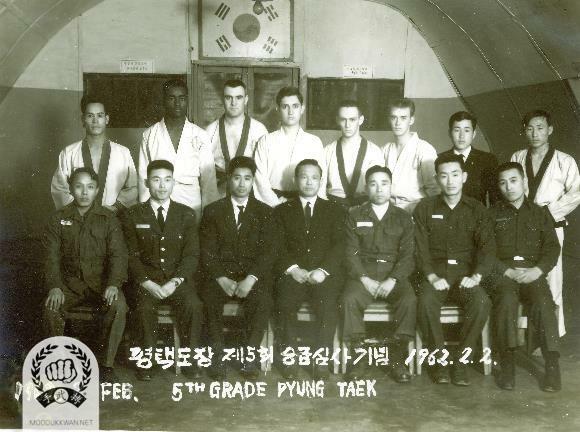 Also in this photo are Jae Chul Shin (Dan Bon# 698) and Chun Sik Kim (Dan Bon #2457) both Sa Boms went on to help establish the US Federation and eventually their own Tang Soo Do organizatioins outside of the Moo Duk Kwan. 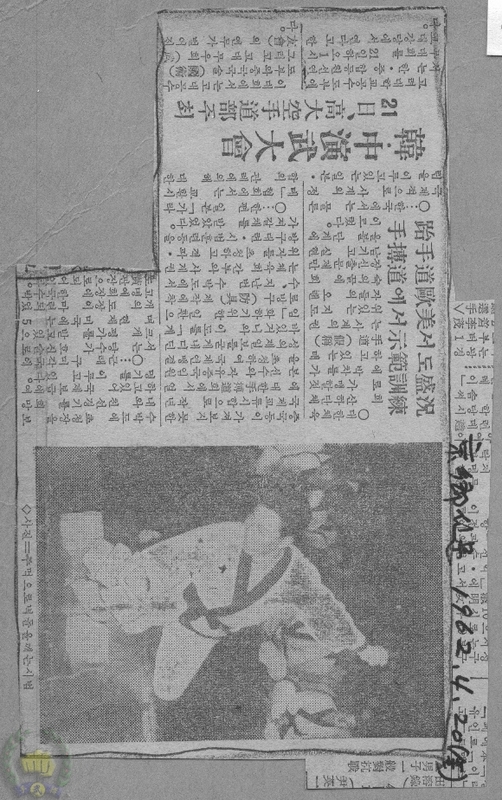 Hwang Kee KJN with Japanese delegate in Japan. 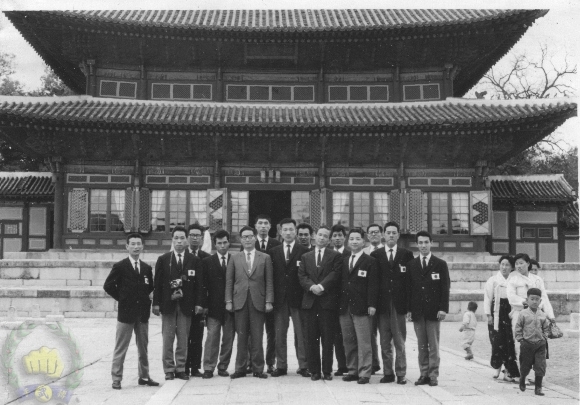 The 1st Japanese team to Korea are taking tour in Korea in 1961. 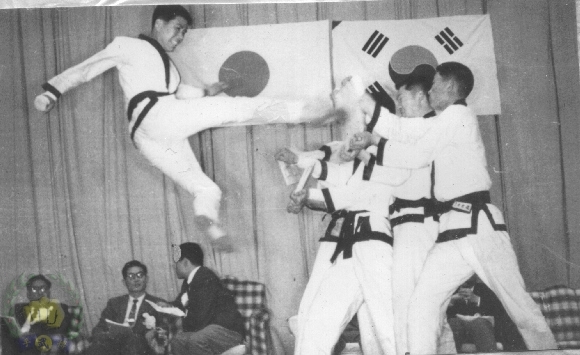 Kwei Byung Yoon, gradmaster of Ji Do Kwan is second left from the Hwang Kee Kwan Jang Nim and Kondo Koichi, head of the All Japan Karate Federation is left of the Hwang Kee Kwan Jang Nim. 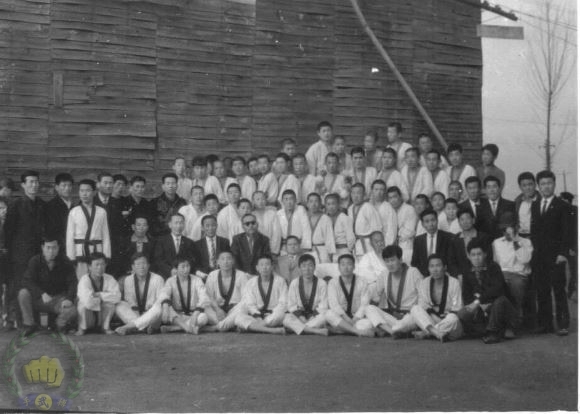 Nov 27, 1960, 26th Dan Classing Championships in Chun Nam Province, the Founder is seated in the center. 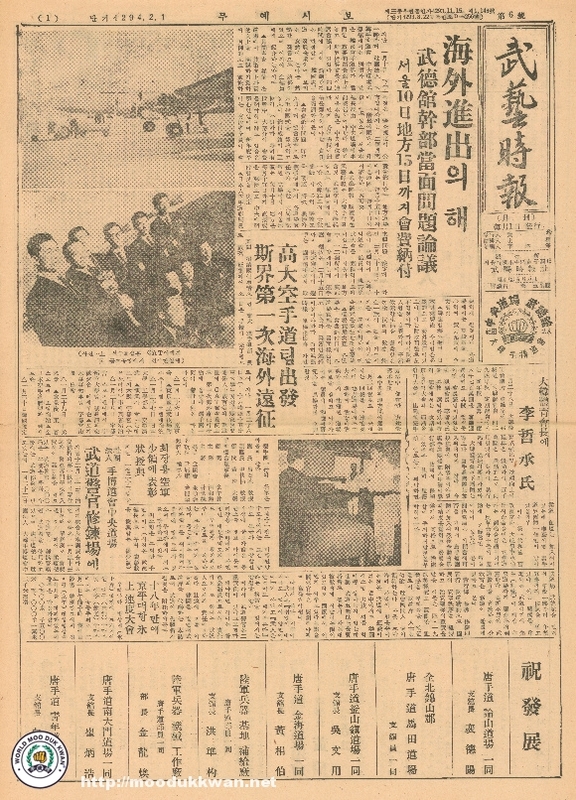 Article in the Dong A Il Bo News paper wrote the demonstrations done by the Japanese team on May 6, 1961. Col. John Butterwick, (Dan Bon #2277) one of the first American Military to bring the MDK to the USA in 1961. 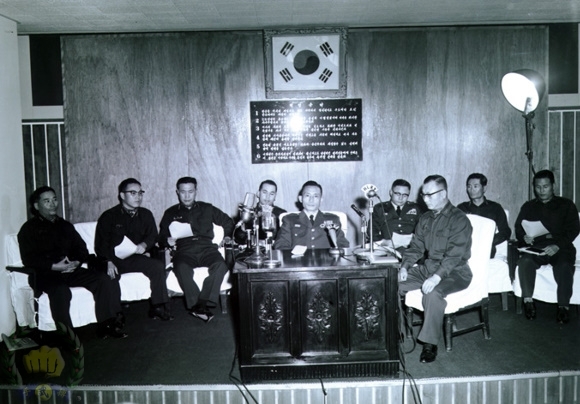 1961 May 16th: Military Revolution lead by Lt. General Park, Chong Hee begins. 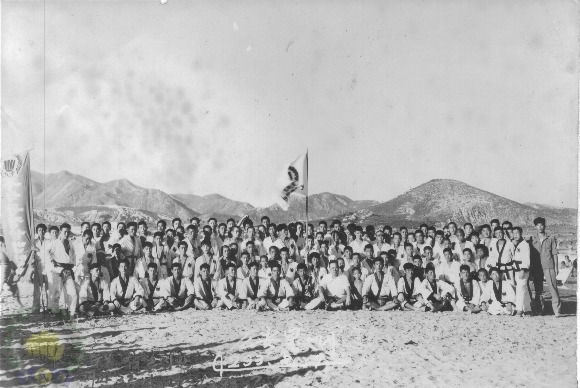 Group who led the military coup. 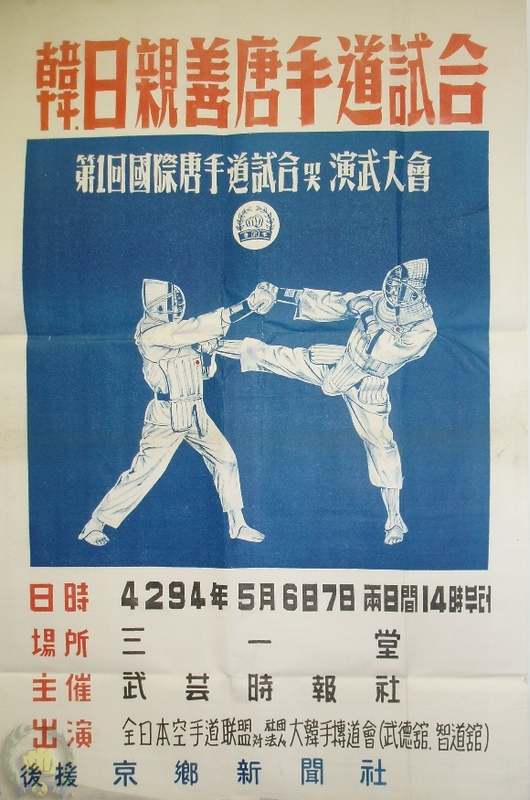 1961 May: Academy and National Police Academy with no reason. 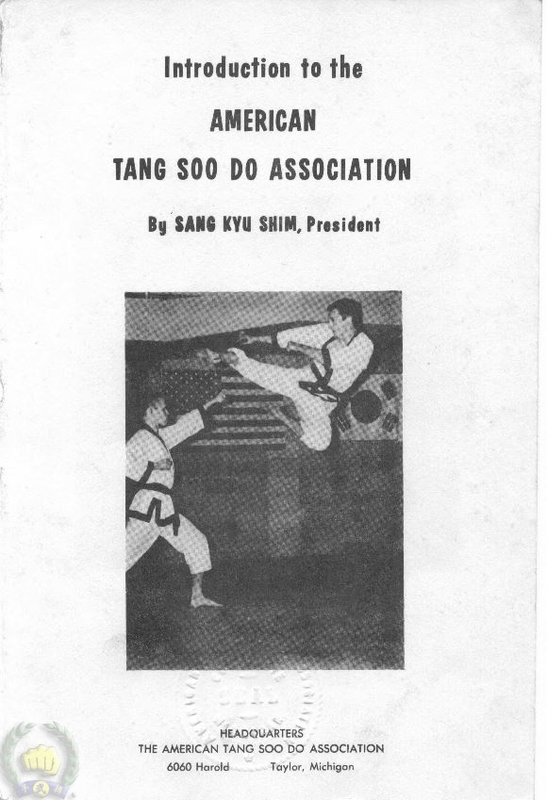 Both lead efforts to dissolve the Korean Soo Bahk Do Association, Moo Duk Kwan, and impede Hwang Kee's activities. 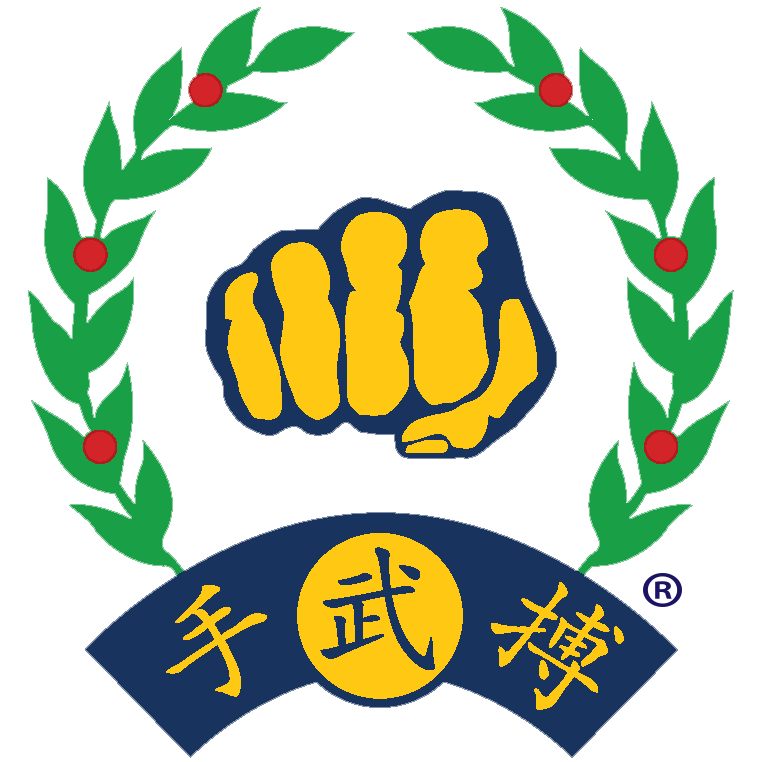 1961 October: Established Moo Duk Kwan in Michigan, USA. Dale Drouillard, first American to receive a Dan Bon in the Moo Duk Kwan. 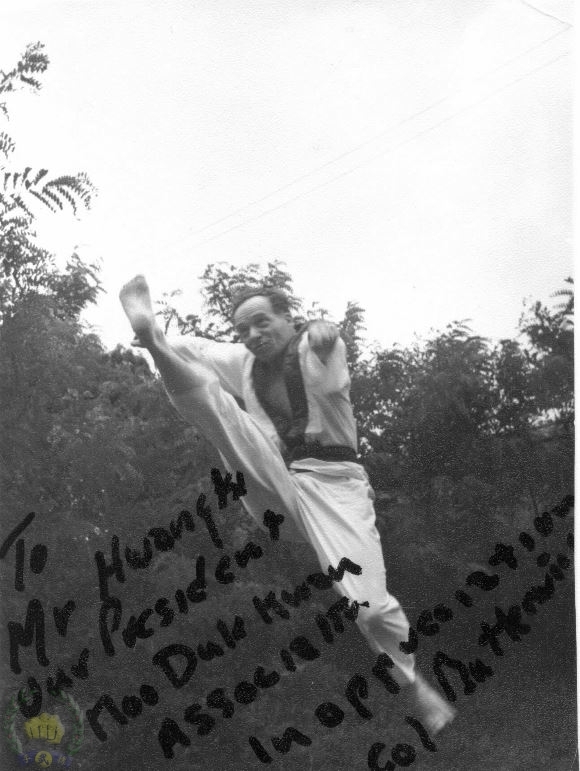 San Kyu Shim SB (Dan Bon#180) and Col Butterwick (Dan Bon #2277) send a note of appreciation to the Founder Hwang Kee in May 1960. 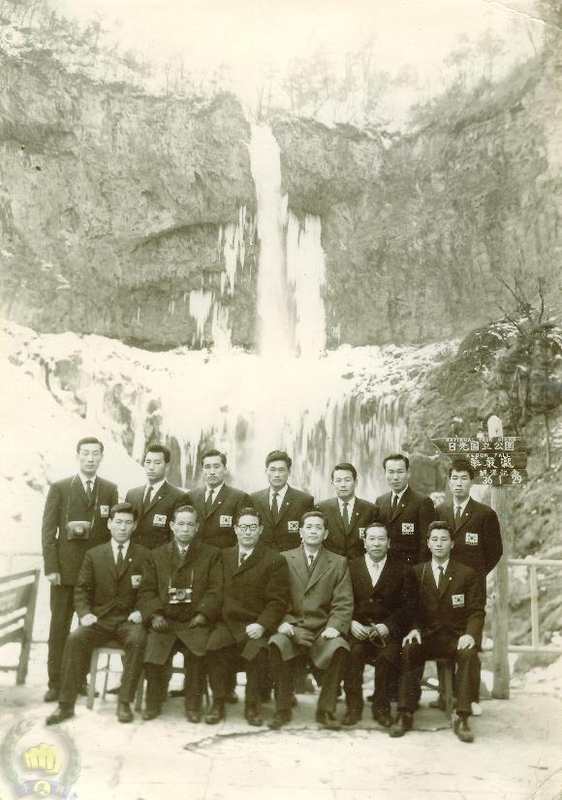 The all Japan Karate team with the Korea University team. 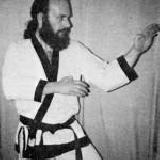 MDK demonstration with E Dan. 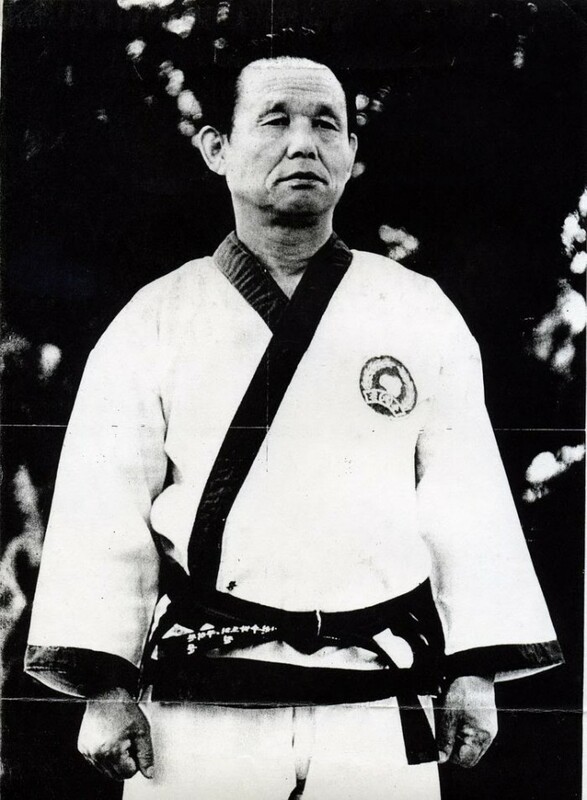 Yang Bal Cha Gi at the Sam Il Dan during the Internationals. 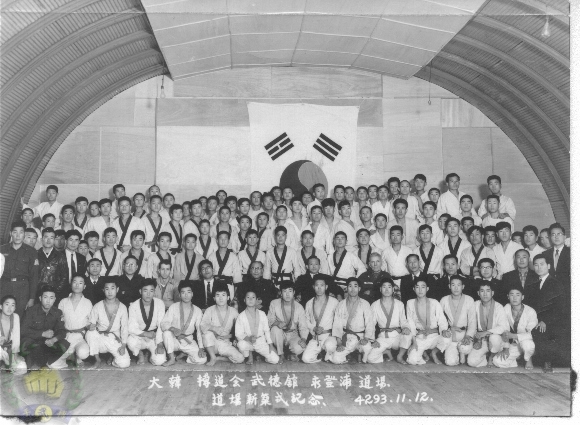 The 2nd Gup Shim Sa at the Kim Po MDK branch Dojang on May 19, 1962. 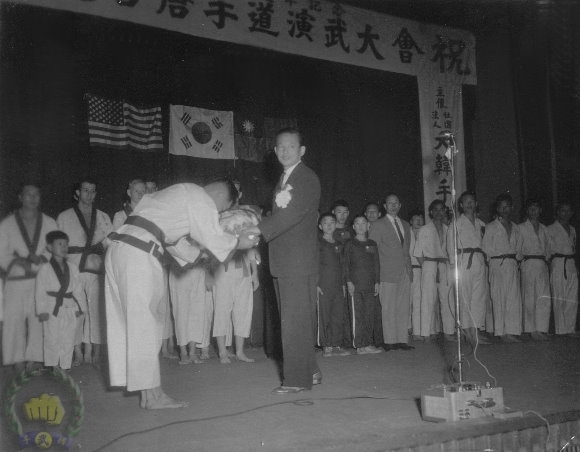 The Gup Shim Sa at the MDK Pyung Taek branch on February 2, 1962. Young Ha Park (21) is sitting next to Hwang Kee KJN. 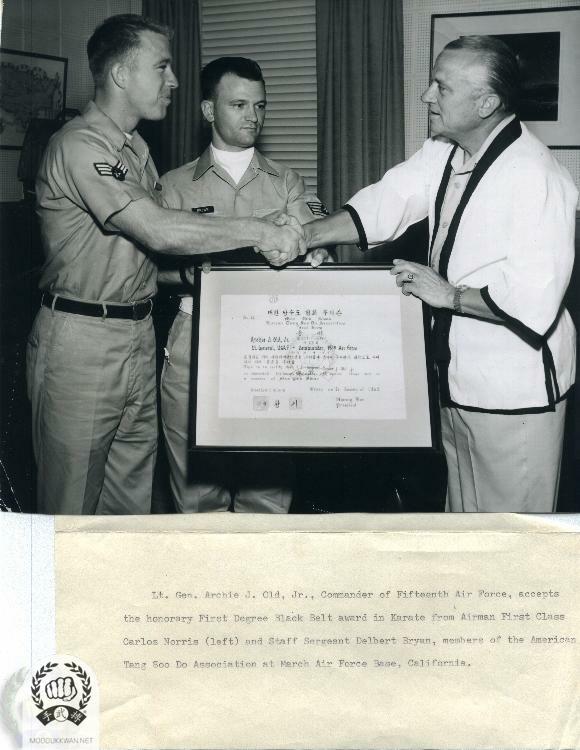 Chuck Norris presents honorary 1st Dan certificate from Moo Duk Kwan founder Hwang Kee to Lt. Col Archie J Old, Jr.
1965 January: Established Moo Duk Kwan branches in Washington D.C., New York, Michigan, California, Washington, Texas and Florida. Impediments to acquire passports/ visa's to travel to teach Soo Bahk Do. Attempts to destroy organizations record of rank and seniority. Revoking the registration and recognition of the same Korean Soo Bahk Do Association. 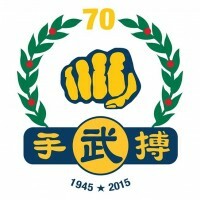 Prohibited from attending international events. 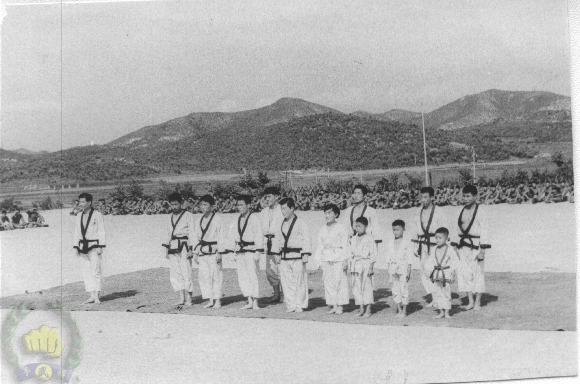 1965 May: Korean Soo Bahk Do Association's Legal status revoked; decision appealed to appellate level and relief granted. 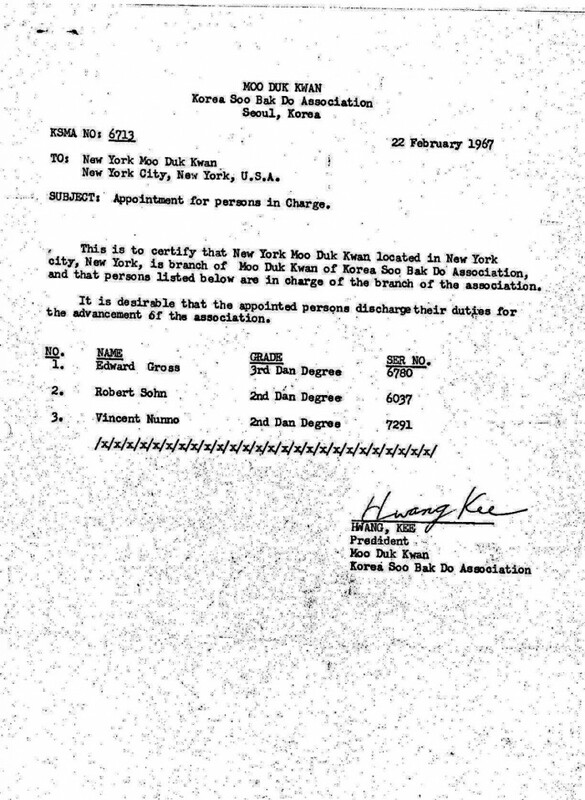 1966: Dr. Robert Sohn (#6037) forms the N.Y Moo Duk Kwan Association. He with Edward Gross (#6780), Vincent Nunno (#7291) were put in charge by Grandmaster Hwang Kee to oversee teaching and promotions in the N.Y. area. 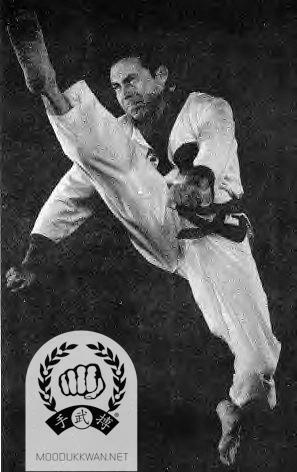 Mr. Robert Sohn, along with Vincent Nunno and Ed Gross established the New York Moo Duk Kwan under the Founders guidance. 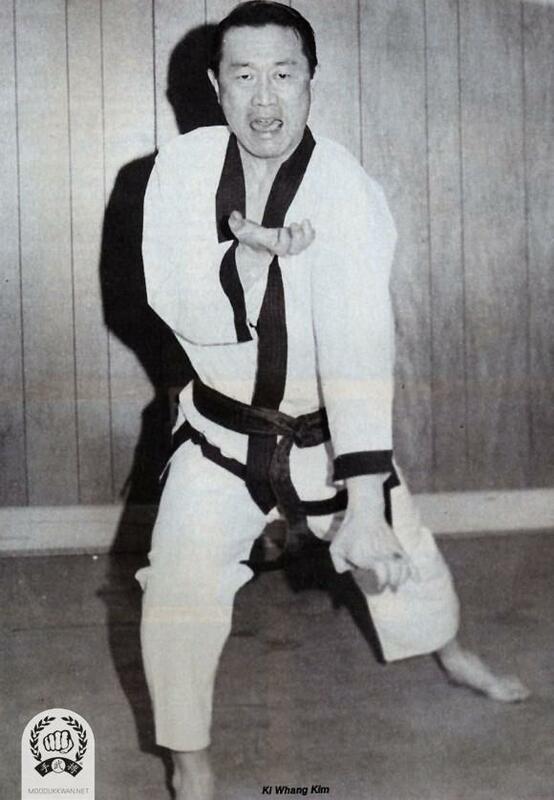 Photo courtesy of Five Towns Karate. 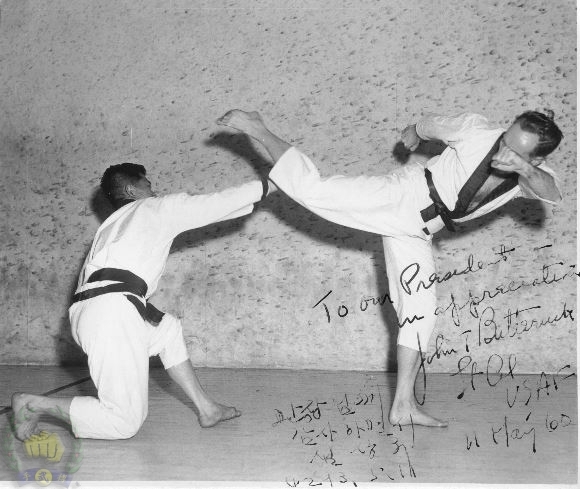 Master Eugene Perceval on the left sparring Vincent Nunno on the right, at the West Village Karate Club, in NYC, 1964-65 Photo from Master Eugene Perceval Personal collection. 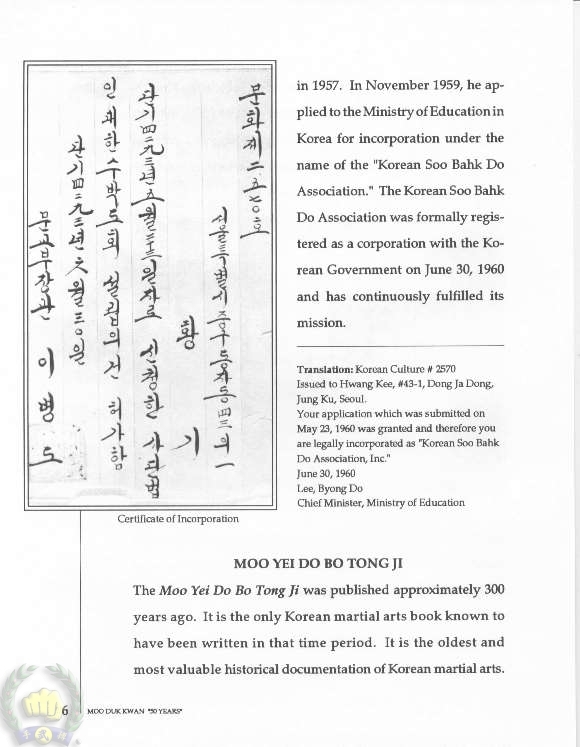 Designation Letter from the Founder/Kwan Jang Nim Hwang Kee, translation. 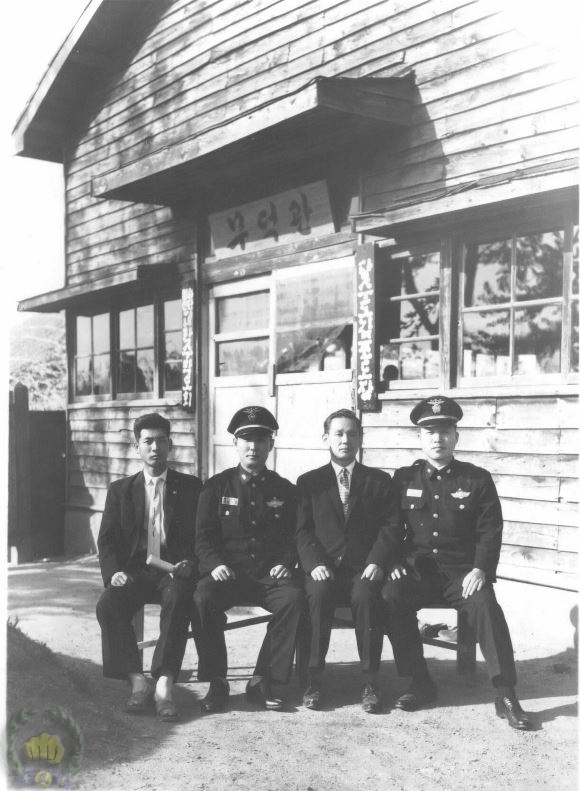 1966 December: Revised charter and by-laws of Korean Soo Bahk Do Association as required by the Korean government. 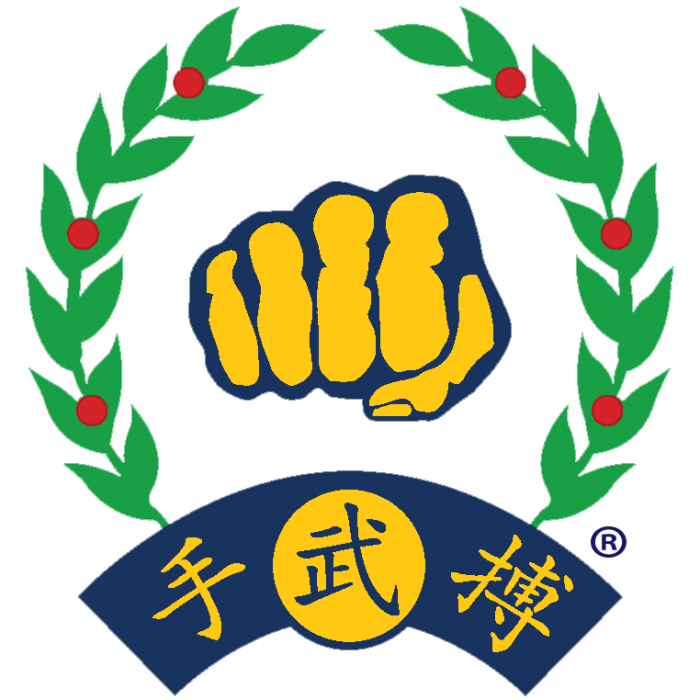 1967: Established Moo Duk Kwan in Malaysia. 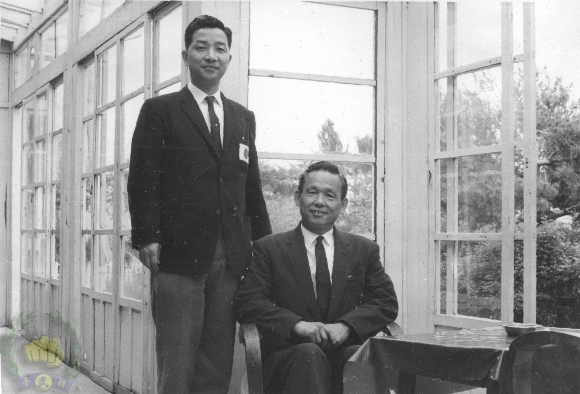 Wha Yong Chung (#410), Soon Ho Chang (#3722). 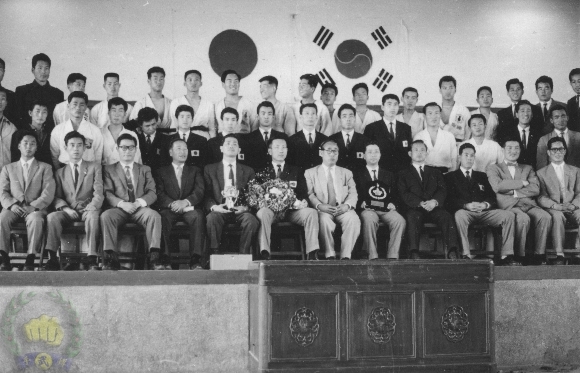 1968: August: Election of new Korean Soo Bahk Do Association Board of Directors and registration with the government.